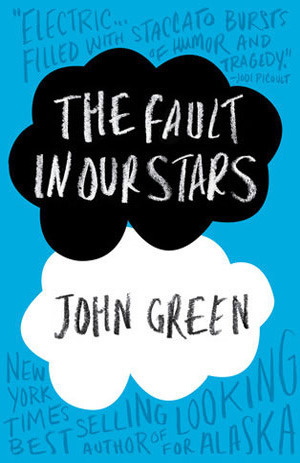 Book Review: The Fault in Our Stars by John Green - Book.Blog.Bake. Diagnosed with Stage IV thyroid cancer at 13, Hazel was prepared to die until, at 14, a medical miracle shrunk the tumours in her lungs… for now. As a rule, I stay away from books with cancer. Not even “cancer books”, but just books in which cancer plays any part. As someone who’s lost a parent to cancer, those books typically make me really angry with their romanticized portrayal of death, illness, and dying. However, this book was written by John Green, and since he wrote Looking for Alaska, which I loved, I decided(after much thought) to give it a try. Even though I really enjoyed Looking for Alaska, I set the bar a little lower for this one. Pretty much, my goal was to read this book without getting angry at someone for capitalizing on the tragedy of cancer. Towards that end, John Green succeeded at that goal. I found I actually did enjoy The Fault in Our Stars, it’s lack of cliche-ness, the inclusion of Amsterdam, and the two main characters. Hazel was not a superhuman character full of dignity and compassion and wisdom. Yes, she was smart, and yes, her disease had made her seriously consider death and life in a way most sixteen-year-olds probably don’t have to, but she still got upset at minor things, watched a lot of TV, and did a lot of other normal, mundane things in between the not-so-mundane things. I understood Hazel’s appeal to Augustus. He was someone who always wanted the world to work on a deeper level. To Augustus, everything was a metaphor, and every day contained some truth about life to uncover. I think Hazel was drawn to Augustus because he was still impressing meaning on a life without doing it in the over-the-top, fake-positivity way that normally accompanies disease. I enjoyed the conversations between the Hazel and Augustus, most of which went most deeper than just their shared experience of cancer. And yes, this book made me both laugh and cry a little, but even though my outward reaction to this book was expressive, I have to admit that while I enjoyed this book, I felt there was something. . . missing. I might have teared up and laughed out loud at the pages in front of me while reading The Fault in Our Stars, but it didn’t affect me the same way that Looking for Alaska did. When I finished this book, I just felt done. I didn’t feel the need to linger and savor before moving on to the next book. Of course, this is just one small aspect of an otherwise good reading experience, so while it might lose a star in the rating for this, overall I would still recommend this book. Final Impression: Overall, I was surprised by my enjoyment in The Fault in Our Stars. It didn’t shy away from complexity and was in no way a cliche cancer book, which I’m really grateful for. However, The Fault in Our Stars didn’t stay with me after I closed the last page like John Green’s first novel did, and I found it pulled me slightly less. A really good read, but not a new favorite. 4/5 stars. You can find The Fault in Our Stars on Amazon, Barnes and Nobles, or The Book Depository. Book Review: A Monster Calls by Patrick Ness - Book.Blog.Bake. The Sunday Wrap-up! (8) | Book.Blog.Bake. I’m always a little embarrassed to admit that I haven’t read anything by John Green. Fortunately, someone has recommended this to me so I will be reading it soon and losing my JG v-card. Here’s hoping I enjoy it, despite the fact that it didn’t linger with you! I’m glad you gave this book a shot, and enjoyed it overall (even if something was missing for you). It’s always so strange to me because everyone talks about Looking for Alaska but though I’ve read it, I remember nothing about it. Not a single thing. But this book hit me hard. I wonder why? I think it’s so strange/interesting how different books stick with different people–one of the reasons I love reading.